Colors elicit feelings, emotions, memories, associations. It’s no wonder then that businesses large and small use colors to add a dimension to their brand identity. What effect do colors really have though? Well it’s safe to say we’re all different. Because of that, we process things differently and associate different things with colors, but when it comes to purchasing items and services, color plays a more pointed role. It’s not like we mentally say, “since yellow is my favorite color, I’m only going to buy things with yellow logos and packaging.” The process is a little more nuanced than that. Our brain looks at the color with a critical eye thinking, “Do these things match? Does bright pink packaging really match this knee brace product?” Sure, it’s eye catching, but a mismatch could swing consumers in the wrong direction. It’s also important for brand recognition. We all know one of the foremost tenants for marketing: differentiation. Companies don’t want to be mistaken for their competition. Think FedEx, UPS, and DHL. Totally different color schemes so no one mixes them up. They each stand alone with their own striking combination. When picking a color for a brand or product/service, it’s much more than what’s a popular color. It matters what the object represents. Eco friendly consumers? Brown or green. Power and vitality? Black or red. It takes a lot of research and profiling to arrive on the best image for your brand, but the rewards are invaluable. Build your empire from the ground up and pay attention to every detail. When you’ve designed your logo, let GTI help you decide on the right printer and make your mark on your boxes. We’ve got to stick together after all. As if anyone ever needs a reason to pop open a bottle of bubbly! This new champagne from Veuve Clicquot, called Naturally Clicquot, comes in 100% recyclable packaging made from paper and the skins of grapes used the make the champagne itself. Being committed to using environmentally responsible innovations in packaging, we saw them use potato starch as a main ingredient in packaging back in 2013 and 2014. As consumers are becoming increasingly aware of the waste they and the products they buy create, Veuve Clicquot is a standout. The trusted champagne will only face gaining more loyal customers with such an environmentally-friendly initiative. Naturally Clicquot communicates the change in packaging right on the box with a large graphic of hanging grapes on one side and an outline of the bottle on the other, all while keeping Veuve Clicquot’s elegant style. Elizabeth Arden’s Taylor Swift Incredible Things carton uses a textured, felt paperboard and rich palette of watercolors that transform inspired graphics into a work of art that beautifully complements the primary container inside—an opaque white bottle, decorated with a watercolor print of Taylor Swift’s silhouette profile. The colorful carton earned a Silver Award in the “Folding Cartons” category for Diamond Packaging at the 28th annual Gold Ink Awards competition, produced by Printing Impressions magazine. Winners were chosen from more than 1,000 entries submitted in 50 different categories. Entries were judged on print quality, technical difficulty, and overall visual effect. The carton was converted utilizing Neenah Paper Royal Sundance Brilliant White Felt paperboard. It is offset-printed with seven colors in-line with UV matte coating. The matte coating conveys the soft, natural aesthetic of the design. The combination of colors and textures create an irresistible sensory presentation that stands out in the retail environment and captures the feminine, youthful vibe of Taylor Swift and her international fan base. 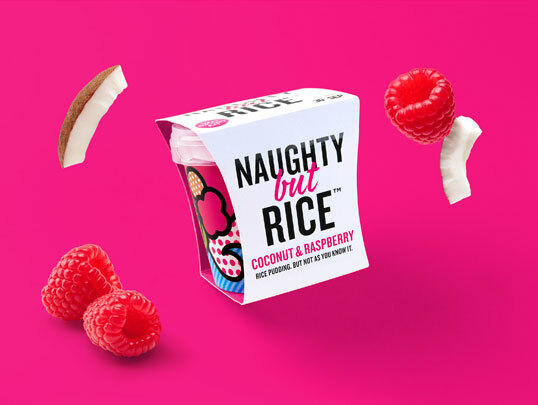 “Rice pudding is rising in popularity, and to coincide with the trend, The Hain Daniels Group has launched Naughty But Rice, a vibrant new brand with a bit of a twist. The clue’s in the name. Naughty But Rice brings pud lovers all the heart and soul of traditional rice pudding with a deliciously contemporary edge. The pots themselves are the piece de résistance, the goal to be impactful. True to the brand personality, the pot designs defy convention with vivd, brightly coloured illustrations (with no branding) to represent the dynamic flavours. There are 31 million possible label outputs from 31 designs. Individualized packaging seems to be the latest trend for beverage giants like Diet Coke and Absolut, and now Bud Light is getting in on the action and bringing it to the U.S. The beer behemoth created 200,000 different cans, variations on 31 designs, using vertical-printing technology from HP. Starting today, the cans will be available to attendees of the Mad Decent Block Party, a music festival that will hit cities across the U.S. and Canada over the next few weeks and run through September. "The [individualized cans are] very much in line with what Bud Light wants to do for millennials," said Alex Lambrecht, vp of Bud Light. "We know they want something unique and an unexpected experience, and I feel that they will be so surprised and inspired when they order a Bud Light and get these cans." Bud Light was looking for an opportunity to amplify consumers' experience with the brand and to put that innovation in their hands, according to Gina Bazigian, packaging innovations manager at A-B InBev. "That's where the packaging came in," said Bazigian. "So, we partnered with HP. Instead of printing these cans through conventional printing, we leveraged their HP Indigo digital-press technology, and what makes that significant is that we also used their HP SmartStream Mosaic algorithm." The algorithm tweaks each can design based on parameters set by Bud Light. "Each time we've printed a label out they're a little bit different, and that allows us to get 31 million possible label outputs from those 31 designs and ensures that no two cans printed are alike," said Bazigian. Lambrecht said it's the first time such technology is being used in the U.S. market. "And this is really tapping into the desire for millennials to have a unique experience," he said. "All 200,000 cans produced will provide 200,000 different experiences." Bud Light's internal creative team partnered with Virtue Worldwide, VICE's in-house creative services agency and Diplo's L.A.-based record label Mad Decent to create the cans. Mad Decent's team created four custom cans; the 27 other designs were done by various artists. With the initiative, Bud Light is testing whether consumers will get excited about individualized cans. "There will be more initiatives in the future," said Lambrecht. "What the scale will be, we are exploring." Click and Grow is a small company that started in 2009. Founder Mattias Lepp drew inspiration from NASA's aeroponics technology, that ultimately fueled his desire to change the way people grew plants. After some experimentation, the Smartpot was created, a self-sufficient plant growing system that operates with just a click of a button. The Smartpot made its first debut in 2011 and its product line has been expanding ever since. A simple cardboard-folded box, designed by AKU, is outlined 360 degrees with the product's minimalist silhouette and slipped in a white paper garment. An already fully ripened Smartpot is shown front and center with simplistic instructions transcribed on the back. The pot, the "grow light", and the specified seeds which are already inserted into the plant cartridge. In addition, the box includes two complementary power adaptors, one for the UK and the other US. Upon opening, you will discover the pot on the bottom tray surround by an easy 5-step instruction manual and below, a user guide for further instructions on the do's and don'ts when using the product as well as how to clean it properly. If you're looking to start this year right and eating healthy is a resolution of yours or you are like me and you have trouble growing any form of vegetation let alone maintain is longevity, then this is a fun and foul proof product to test out. Whether you are seeking to grow some aromatic herbs such as lemongrass, thyme or basil or you are more in favor of sweet summer fruit, with the Smartpot, you will have these desired fresh ingredients growing in your own home in less than 2 months. With an easy setup that takes less than 5 minutes, the product is sleek in design and can compliment any part of the house. Once plugged in and filled with water, a green light appears indicating that the growth process has begun. As water levels plummet, a red light will flash letting you know it is time to refill the pot. To exponentiate the sprouting, a "grow light" is hooked on the back of the system allowing a maximum amount of "sunlight" to reach the crop. Unlike traditional gardening, the Smartpot does not require professional experience or knowledge of what soil is best for what plant, when to water it or climate control. You can literally place this product in a dark room and with the help of its own "grow light", it will transform into a magical garden. Marriage proposals can be scary, even if you know that the other person will say yes. How and where you’ll ask is always a factor, as well as where to hide the ring. After all, it’d be tragic if it were discovered beforehand. A slimline engagement ring box called Clifton solves this potential problem. Designed by Andrew Zo, it’s no bigger than the size of a wallet and slides into your pocket with ease. Plus, when you open the Clifton, the ring does more than just appear - it pirouettes into position. This is because a pop-up mechanism is meant to present the ring as if it’s a blooming flower. Zo is a packaging designer by trade, and he first began developing Clifton as a student at Emily Carr University in Vancouver, Canada. He built a paper-based proof of concept in 2011 and over the past three years has refined it into the leather-bound product that we see today. Clifton is available for purchase with a pricetag of $90. While that might seem like a lot, consider that the average engagement ring is $2,300; this means that the box only adds 4% onto the total expense. It could be seen as a negligible cost to make a once-in-a-lifetime event even more special. The Second Aid is a collaboration between NOSIGNER and the Kohshin Trading company of Sendai, Japan. The disaster kit features helpful tips on pack for what to do in a major earthquake from OLIVE (also by NOSIGNER), a public forum launched just 40 hours after the initial earthquake of 2011. The kit is smartly designed to include information, food supplies, as well as supplies for personal needs. Having been born and raised in Los Angeles, I am no stranger to earthquakes and how fast they can disrupt everything, so this would be my ideal version for sure!